Heavy rain, snow and wind pummeled much of California Thursday, causing at least five deaths, leaving thousands without power and forcing wildfire victims threatened by floods to flee their homes. "Flash flooding is a dangerous and life threating situation," the Butte County sheriff's department said. "Due to the dynamic nature of debris flow and flash flood events, residents should not wait for an evacuation order to take action." 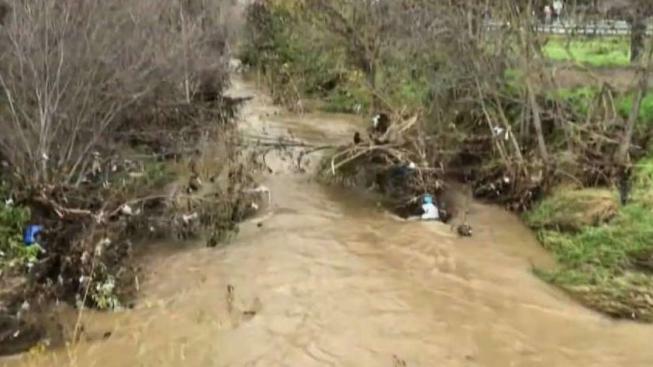 The CHP says high winds knocked over a large tree that fell into a homeless encampment Wednesday afternoon, killing a 42-year-old man. The CHP said the victim may have been trying to shelter under some trees near an Oakland freeway when he was crushed by a 30-foot-long branch. The man may have been "just trying to stay dry," CHP officer Herman Baza said. "Unfortunately, that protection was deadly." Meanwhile, blizzard conditions blanketed the higher elevations of the Sierra Nevada and the region's ski resorts with as much as four feet of snow just in time for the three-day Martin Luther King Jr. holiday weekend. San Francisco saw only an inch of rain but Venado in Sonoma County got 5 inches over 24 hours. Also in Southern California, fog on a mountain highway triggered a 19-vehicle crash. Thirty-five people were evaluated for injuries after the pileup on Interstate 15 in Cajon Pass, but most declined to be taken to hospitals, the San Bernardino County Fire Department said.